During the second half of the 20th century the dividing line between Science Fiction and Hard Science became increasingly blurred as innumerable inventions and pioneering products were forged in the white heat of a technological revolution. Even the quietest backwaters of academia were energised in this era of innovation and invention. In the genteel world of Astronomy the imaginative and inventive Fred Whipple pitched-up a deceptive curved ball that’s best called the Great Snowball of 1950. A new comet model is presented that resolves the chief problems of abnormal cometary motions and accounts for a number of other cometary phenomena. The nucleus is visualized as a conglomerate of ices, such as H2O, NH3, CH4, CO2 or CO, (C2N2? ), and other possible materials volatile at room temperature, combined in a conglomerate with meteoric materials, all initially at extremely low temperatures (<50° K). Vaporization of the ices by externally applied solar radiation leaves an outer matrix of non-volatile insulating meteoric material. The imaginative nature of the Great Snowball of 1950 was highlighted by Fred Whipple when he noted that many of these “visualized” frozen substances were “unobserved”. The model predicts a large excess of unobserved hydrides, H2O, NH3, and CH4 molecules, as compared to the observed CO+, C2, and CN. A Comet Model. II. Physical Relations for Comets and Meteors. However, back in 1950, Fred Whipple wasn’t the only person pitching new cometary concepts. Out of left field the equally imaginative and inventive Immanuel Velikovsky pitched up a controversial cometary curved ball that’s best called the Smoking Fireball of 1950. Worlds in Collision is a book written by Immanuel Velikovsky and first published April 3, 1950. The book postulated that around the 15th century BCE, Venus was ejected from Jupiter as a comet or comet-like object, and passed near Earth (an actual collision is not mentioned). During the centuries when Venus was a comet, it had a tail. The early traditions of the peoples of Mexico, written down in pre-Columbian days, relate that Venus smoked. It may thus be concluded that since the Mexicans called Venus “a star that smoked,” they considered it a comet. It is also said in the Vedas that the star Venus looks like fire with smoke. Apparently, the star had a tail, dark in the daytime and luminous at night. The publication of the Great Snowball of 1950 a few months before the arrival of the well publicised Smoking Fireball of 1950 was probably not purely coincidental. Velikovsky’s ideas had been known to astronomers for years before the publication of the book, partially by his writing to astronomer Harlow Shapley of Harvard, partially through his 1946 pamphlet Cosmos Without Gravitation, and partially by a preview of his work in an article in the August 11, 1946, edition of the New York Herald Tribune. An article about the upcoming book was published by Harper’s Magazine in January 1950, which was followed by an article in Newsweek (Bauer 1984:3-4) and Reader’s Digest in March 1950. In the ensuing controversy the Smoking Fireball of 1950 was “summarily rejected by the physics community” and widely dismissed as “pseudoscientific”. The plausibility of the theory was summarily rejected by the physics community, as the cosmic chain of events proposed by Velikovsky contradicts basic laws of physics. Shapley, along with others such as astronomer Cecilia Payne-Gaposchkin (also at Harvard), instigated a campaign against the book before its publication. Initially, they were highly critical of a publisher as reputable as Macmillan publishing such a pseudoscientific book, even as a trade book, and then their disapproval was re-invigorated when Macmillan included it among other trade books of possible interest to professors listed under the category “Science” in the back of a textbook catalog mailed to college professors. The fundamental criticism against this book from the astronomy community was that its celestial mechanics were irreconcilable with Newtonian celestial mechanics, requiring planetary orbits which could not be made to conform to the laws of conservation of energy and conservation of angular momentum (Bauer 1984:70). With Velikovsky vanquished the “visualized” Great Snowball of 1950 quietly assumed the mantle of mainstream Settled Science. As such, they are popularly described as “dirty snowballs” after Fred Whipple’s model. However, some comets may have a higher dust content, leading them to be called “icy dirtballs”. Fred Whipple and his triumphant Great Snowball of 1950 had, by default, secured a fairytale happily ever after ending in the Annals of Academia. The return of Comet Halley during 1985/6 fostered a renewed interest in comets and the over excited astronomers believed they could finally prove comets are a “conglomerate of ices”. However, their gleeful smiles soon devolved into news management spin and grin. The hyped-up good news was the detection of water around Comet Halley. The underplayed bad news was the water wasn’t emanating from the nucleus. 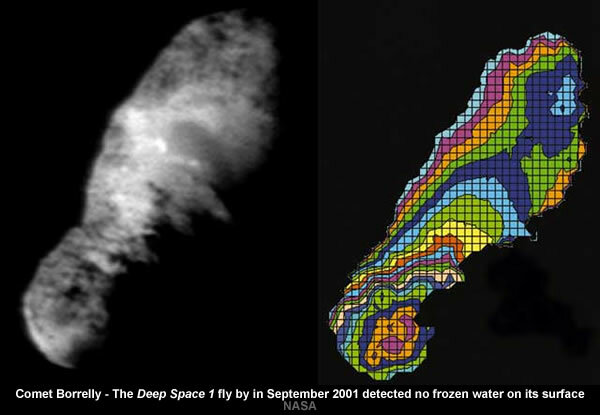 High resolution (λ/Δλ ≈ 3×105) near-infrared observations of H20 emission from Comet Halley were acquired at the time of maximum post-perihelion geocentric Doppler shift. The observed widths and absolute positions of the H20 line profiles reveal characteristics of the molecular velocity field in the coma. These results support H20 outflow from a Sun-lit hemisphere or the entire nucleus, but not from a single, narrow jet emanating from the nucleus. The successful Giotto fly by of Comet Halley only added to the news management problem. Giotto was a European robotic spacecraft mission from the European Space Agency. The spacecraft flew by and studied Halley’s Comet and in doing so became the first spacecraft to make close up observations of a comet. 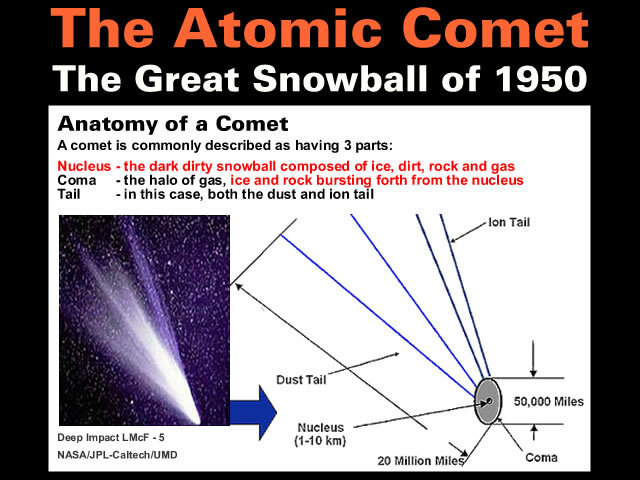 Firstly, Giotto revealed Comet Halley isn’t really a “dirty snowball”. “We discovered that a comet is not really a ‘dirty snowball’ since dirt is dominant, not ice,” said Horst Uwe Keller of the Max Planck Institut für Aeronomie, Katlenburg-Lindau, Germany. Secondly, Giotto revealed Comet Halley is more tarball than snowball. The month following the Giotto fly by one of the more curious episodes in the long running Great Snowball of 1950 soap opera was unleashed upon an unsuspecting world. In April 1986 it was announced the Earth is being bombarded by “small comets (made of ice and water)” at the mind boggling rate of one wet watery comet every three seconds. It all began in the mid-1980s, when a camera aboard a NASA spacecraft called Dynamics Explorer presented me with data that many scientists would have ignored or overlooked. Curious black spots appeared in the images of Earth’s aurora, one of the phenomena I have devoted my career to studying as an experimental physicist. 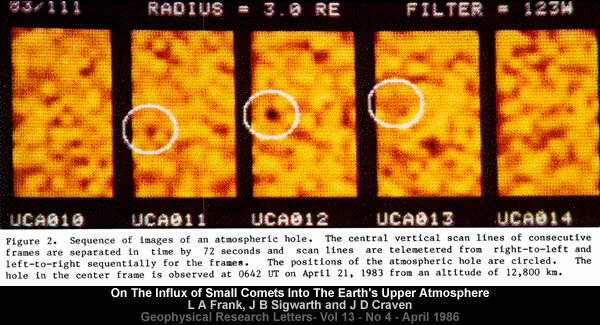 I came to realize that the black spots in the images were not caused by “instrument noise,” as many scientists believed, but were evidence of a remarkable geophysical phenomenon occurring unnoticed right above our heads. The Earth’s atmosphere was being bombarded by house-sized, water-bearing objects traveling at 25,000 mph, one every three seconds or so. That’s 20 a minute, 1,200 an hour, 28,800 a day, 864,000 a month and more than 10 million a year. Spelled out in this way, the numbers truly boggle the mind. The Big Splash is a 1990 book written by Louis A. Frank with Patrick Huyghe. In the book, Frank claims to have found scientific evidence that every year, millions of small comets (made of ice and water) strike the Earth’s atmosphere, and that these comets created Earth’s lakes, rivers and oceans. While many scientists disputed Frank’s hypothesis, he continued to argue that there are tests which can be performed which would either rule it out or confirm it. The interesting aspect of this “disputed” hypothesis saga is that the emissions of the OH radical were used as a proxy for cometary water because water is difficult to detect as “there is no strong fluorescence emissions from water at ultraviolet and visible wavelengths”. We use a camera on the Polar spacecraft to observe the emissions of the OH radical which is produced by the photodissociation of water by solar radiation in the water clouds from the disruption of small comets. Because there is no strong fluorescence emissions from water at ultraviolet and visible wavelengths the OH emissions act as proxy for the presence of the cometary water molecules. Whether OH emissions are a valid proxy for the arrival of cometary water appears highly debatable considering the spectra of comets frequently display large OH emission spikes. Water is relatively transparent to visible light, near ultraviolet light, and far-red light, but it absorbs most ultraviolet light, infrared light, and microwaves. The expectations of the astronomers were raised once again in 1994 when Comet Shoemaker–Levy 9 disintegrated to form a train of 21 Great Snowballs aimed directly at Jupiter. Comet Shoemaker–Levy 9 was a comet that broke apart in July 1992 and collided with Jupiter in July 1994, providing the first direct observation of an extraterrestrial collision of Solar System objects. Anticipation grew as the predicted date for the collisions approached, and astronomers trained terrestrial telescopes on Jupiter. Again, the gleeful smiles rapidly devolved into spin and grin when the 21 Great Snowballs turned into fireballs as they collided with Jupiter. The first impact occurred at 20:13 UTC on July 16, 1994, when fragment A of the nucleus entered Jupiter’s southern hemisphere at a speed of about 60 km/s (35 mi/s). Despite published predictions, astronomers had not expected to see the fireballs from the impacts and did not have any idea in advance how visible the other atmospheric effects of the impacts would be from Earth. One of the surprises of the impacts was the small amount of water revealed compared to prior predictions. In 2001 astronomers hoped Deep Space 1 would end the Great Snowball drought when it flew past Comet Borrelly. Comet Borrelly or Borrelly’s Comet (official designation: 19P/Borrelly) is a periodic comet, which was visited by the spacecraft Deep Space 1 in 2001. Launched on 24 October 1998, the Deep Space 1 spacecraft carried out a flyby of asteroid 9969 Braille, which was its primary science target. The mission was extended twice to include an encounter with comet 19P/Borrelly and further engineering testing. And again astronomers had to grin and bear it when they were confronted with a hot, dry tarball that’s “about as dark as a blot of photocopy toner”. Comets are sometimes described as “dirty snowballs,” but a close flyby of one by NASA’s Deep Space 1 spacecraft last fall detected no frozen water on its surface. “Comet Borrelly is in the inner solar system right now, and it’s hot, between 26 and 71 degrees Celsius (80 and 161 degrees Fahrenheit), so any water ice on the surface would change quickly to a gas, ” said Dr. Bonnie Buratti, JPL planetary scientist and co-author of the paper. Borrelly is unusually dark for an object in the inner solar system. The comet’s surface is about as dark as a blot of photocopy toner, possibly the darkest surface in the solar system. Nonetheless, like water, hope springs eternal. The results from the Stardust fly past of Comet 81P/Wild are simply stunning. Comet 81P/Wild, also known as Wild 2, is a comet named after Swiss astronomer Paul Wild, who discovered it on January 6, 1978, using a 40-cm Schmidt telescope at Zimmerwald, Switzerland. NASA’s Stardust Mission launched a spacecraft, named Stardust, on February 7, 1999. It flew by Wild 2 on January 2, 2004, and collected particle samples from the comet’s coma, which were returned to Earth along with interstellar dust it collected during the journey. Although “water was not found” on Comet Wild-2 the Stardust spacecraft collected particle samples from the comet’s coma which were returned to Earth for analysis. The subsequent analysis found minerals that “must have formed in the presence of water”. These results were excitedly reported as “convincing evidence of liquid water on a comet”. The first convincing evidence of liquid water on a comet comes from analysis of a sample of Comet Wild-2, returned to Earth by NASA’s Stardust space mission. While actual water was not found on Comet Wild-2, the Arizona scientists did find iron and copper sulfide minerals that must have formed in the presence of water. More sober minded scientists were stunned. Firstly, the minerals “formed in the presence of water” suggested the five kilometre wide Comet 81P/Wild was once a “low-temperature hydrothermal” Space Spa. The discovery of nickel-, copper-, and zinc-bearing iron sulfides from comet 81P/Wild 2 (Wild 2) represents the strongest evidence, in the Stardust collection, of grains that formed in an aqueous environment. The cubanite is the low temperature orthorhombic form, which constrains temperature to a maximum of 210 °C. The Stardust and Orgueil pyrrhotites are the 4C monoclinic polytype, which is not stable above ∼250 °C. Taken together, these constraints attest to low-temperature hydrothermal processing. Cubanite occurs in high temperature hydrothermal deposits with pyrrhotite and pentlandite as intergrowths with chalcopyrite. It results from exsolution from chalcopyrite at temperatures below 200 to 210 °C. It has also been reported from carbonaceous chondrite meteorites. Secondly, for gradualist scientists, the evidence suggested a [unthinkable] “radial mixing of material” had occurred between the Inner Solar System and the Outer Solar System. Our analyses of these minerals provide constraints on large scale issues such as: heat sources in the comet-forming region; aqueous activity on cometary bodies; and the extent and mechanisms of radial mixing of material in the early nebula. The sulfides in the Wild 2 collection are most likely the products of low-temperature aqueous alteration. They provide evidence of radial mixing of material (e.g. cubanite, troilite) from the inner solar system to the comet-forming region and possible secondary aqueous processing on the cometary body. Short-period comets originate in the Kuiper belt or its associated scattered disc, which lie beyond the orbit of Neptune. Long-period comets are thought to originate in the Oort cloud, a spherical cloud of icy bodies extending from outside the Kuiper belt to halfway to the nearest star. On the other hand, catastrophists are free to interpret these stunning results from Comet 81P/Wild as confirmation that a once watery planet exploded in the “gap” between Mars and Jupiter. The origin of “the other big bang theory” dates back to 1766 when the astronomer Johann Daniel Titius of Wittenberg noted a strange “gap” [or “empty space”] in the pattern of planetary distances. Astronomers concluded that there must be another planet in the “gap” between Mars and Jupiter. However, the astronomers could only find planetary triage in the “gap” between Mars and Jupiter. Therefore, it is unsurprising that the astronomers began to speculate that the asteroids were created when a planet exploded in the “gap” between Mars and Jupiter. The search for the ever illusive Great Snowball in the Sky continued in 2005 with the well publicised Deep Impact mission deliberately crashing a 100 kilogram copper “Cratering Mass” [travelling at 10.2 km/s] into the very dark Comet 9P/Tempel. Its nucleus measures 7.6 km × 4.9 km (4.7 mi × 3.0 mi). Measurements taken by the Hubble Space Telescope in visible light and the Spitzer Space Telescope in infrared light suggest a low albedo of only 4%. It was designed to study the interior composition of the comet Tempel 1 (9P/Tempel), by releasing an impactor into the comet. At 05:52 UTC on July 4, 2005, the impactor successfully collided with the comet’s nucleus. The impact excavated debris from the interior of the nucleus, forming an impact crater. But the impact region had no surface ice and Comet 9P/Tempel was “less icy” than expected. The Deep Impact flyby spacecraft includes a 1.05 to 4.8 μm infrared (IR) spectrometer. Although ice was not observed on the surface in the impact region, strong absorptions near 3 μm due to water ice are detected in IR measurements of the ejecta from the impact event. Photographs taken by the spacecraft showed the comet to be more dusty and less icy than had been expected. In 2011 astronomers [again] became overexcited anticipating the meltdown of the “conglomerate of ices” called Comet Lovejoy as it travelled through the several million degree solar corona. But, once again, supercilious smiles turned to news management spin and grin when the only thing that melted down was the Settled Science. 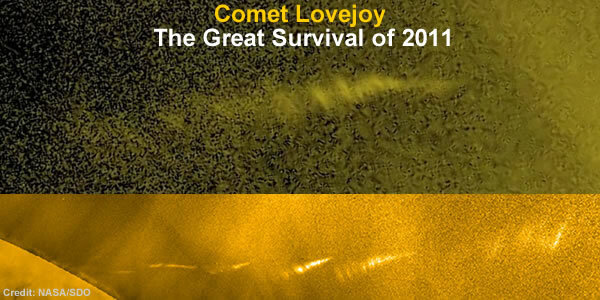 In December 2011 the mainstream huddled around their computers to watch the fiery death of the Sun grazing Comet Lovejoy [designated C/2011 W3 (Lovejoy)] as it approached perihelion. But when Comet Lovejoy emerged from the behind the Sun [on its return journey] the mainstream realised they were actually watching the meltdown of Settled Science. Comet Lovejoy was also deemed [by the mainstream] to be a dirty snowball which would meet a “fiery fate” as it travelled through “the several million degree solar corona” at perihelion some 120,000 kilometres [or 140,000 km – depending upon source] above the stellar surface. Bringing the Great Snowball of 1950 narrative right up to date are the latest [and probably greatest] set of observations from the European Space Agency’s Rosetta Mission to the very dark [albedo 0.06] Comet 67P/Churyumov–Gerasimenko. 67P/Churyumov–Gerasimenko is a Jupiter-family comet, originally from the Kuiper belt, with a current orbital period of 6.45 years, a rotation period of approximately 12.4 hours and a maximum velocity of 135,000 km/h (38 km/s; 84,000 mph). Churyumov–Gerasimenko is approximately 4.3 by 4.1 km (2.7 by 2.5 mi) at its longest and widest dimensions. It came to perihelion (closest approach to the Sun) on 13 August 2015. Churyumov–Gerasimenko was the destination of the European Space Agency’s Rosetta mission, launched on 2 March 2004. Rosetta rendezvoused with Churyumov–Gerasimenko on 6 August 2014 and entered orbit on 10 September 2014. Rosetta’s lander, Philae, landed on the comet’s surface on 12 November 2014, becoming the first spacecraft to land on a comet nucleus. On 30 September 2016, the Rosetta spacecraft ended its mission by landing on the comet in its Ma’at region. Observations reveal there are “no ice-rich patches” on Comet 67P/Churyumov–Gerasimenko. In active areas, the changes in spectral slope and absorption feature width may suggest small amounts of water-ice. However, no ice-rich patches are observed, indicating a generally dehydrated nature for the surface currently illuminated by the Sun. The Organic-Rich Surface of Comet 67p/Churyumov-Gerasimenko as Seen by VIRTIS/Rosetta – F Capaccioni, A Coradini, G Filacchione, S Erard, G Arnold, et al. Whether the very dark and “dehydrated” Comet 67P/Churyumov–Gerasimenko can be reasonably described [or even “visualized”] as a “conglomerate of ices” [or a “dirty snowball” or even an “icy dirtball”] seems extremely doubtful when there are “no ice-rich patches” but plenty of sand dunes covering parts of its very active surface. 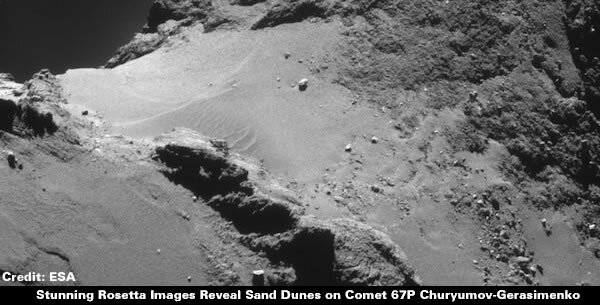 They are still dreaming of a dirty snowball whilst looking at the “sand dunes” on Comet 67P Churyumov-Gerasimenko. Apparently, these are “dusty dunes” because “it’s not sand as we know it” – just like its not ice as we know it. These observations unquestionably place the mainstream at The Cometary Crossroads. Fred Whipple’s Snowball visualization has run it’s course. 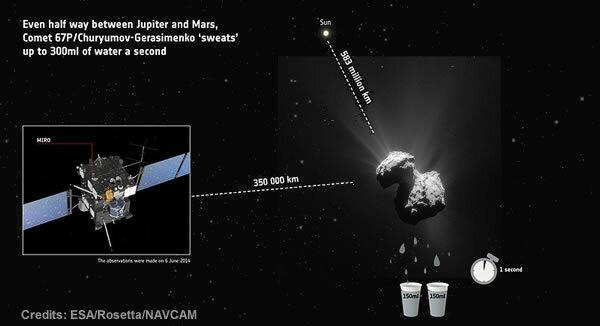 The dark “dehydrated” comet that “sweats” is an evasion that’s run out of steam. When I was a child I was told: You can’t get blood out of a stone! How do you get water out of a stone? It’s time the mainstream shook-off the visualized snow from their dehydrated balls. Gallery | This entry was posted in Astrophysics, Atmospheric Science, Atomic Comet, Books, Catastrophism, Comets, Water. Bookmark the permalink. Equally one might consider the possibility that this debris etc came from the documented ‘interactions’ between the planets, specifically Mars and Earth, both of which show enormous “excavations” on their respective surfaces. Very good Tim. Enjoyed that one. An encyclopedic interrogation of the Dirty Snowball hypothesis. I have been waiting for such an overview for a long time. Do comets that are “dark as a blot of photocopy toner” with a “nucleus … blacker than coal” provide a source for the layers of “dark earth” or “dunkler Moder” that separate the High Middle Ages of the 10th century AD from Roman Civilization? Isn’t time for geoarchaeologists to look at the sky? As you say they don’t seem to learn from their icy snowball embarrassments. Strange. Given that ‘Ceres is estimated to compose approximately one third of the mass of the entire asteroid belt’ (Wikipedia) but has a mass of only 0.00015 Earths, any exploding planet in that region must have been a fairly modest thing. It’s the initial estimation of mass that is the problem, since every calculation using Newtonian mechanics says the comet bodies have a density of about 1, Vis ice. The Sun’s density is 1,5 and that forces the deduction of a hydrogen core etc. No one seems interested in questioning Newton’s theory in the first place. My own field experience with highly anomalous gravity data simply is dismissed by the “experts” as instrument failure; the drillers and I disagreed. The old story of leading a horse to water and having it also drink. Most of the dust was no larger than specks of cigarette smoke. Two major classes of dust particles were found. One was dominated by the light ‘CHON’ elements – carbon, hydrogen, oxygen and nitrogen. The other was rich in mineral-forming elements – sodium, magnesium, silicon, iron and calcium. All of the comet’s light elements (except nitrogen) were found in the same relative abundance as for the Sun. A wee grain guessed to be .1 to 1 gram mass knocked the spacecraft out of alignment????? Mighty be the Gravity, with apologies to Yoda. More likely an electrical source could be the culprit. Summary: When Comet C/2013 A1 (Siding Spring) passed just 140,000 kilometers from Mars on 19th October 2014, depositing a large amount of debris in the Martian atmosphere, space agencies coordinated multiple spacecraft to witness the largest meteor shower in recorded history. It was a rare opportunity, as this kind of planetary event occurs only once every 100,000 years. So more neutral molecules at lower depths. While the charged particles are [primarily] stuck in the ionosphere. Data from observations carried out by NASA’s Mars Atmosphere and Volatile Evolution (MAVEN) mission, NASA’s Mars Reconnaissance Orbiter (MRO), and a radar instrument on the European Space Agency’s (ESA’s) Mars Express spacecraft have revealed that debris from the comet added a temporary and very strong layer of ions to the ionosphere, the electrically charged layer high above Mars. MRO’s Shallow Subsurface Radar (SHARAD) also detected the enhanced ionosphere. Images from the instrument were smeared by the passage of the radar signals through the temporary ion layer created by the comet’s dust. SHARAD scientists used this smearing to determine that the electron density of the ionosphere on the planet’s night side, where the observations were made, was five to 10 times higher than usual. I guess all the comets we closely observe are huge anomalies. We’ll find those snowballs out there soon enough, if only we keep using our special X-ray glasses to see through those rocks.